This plan proposes an open space, the Forum, in front of the university. 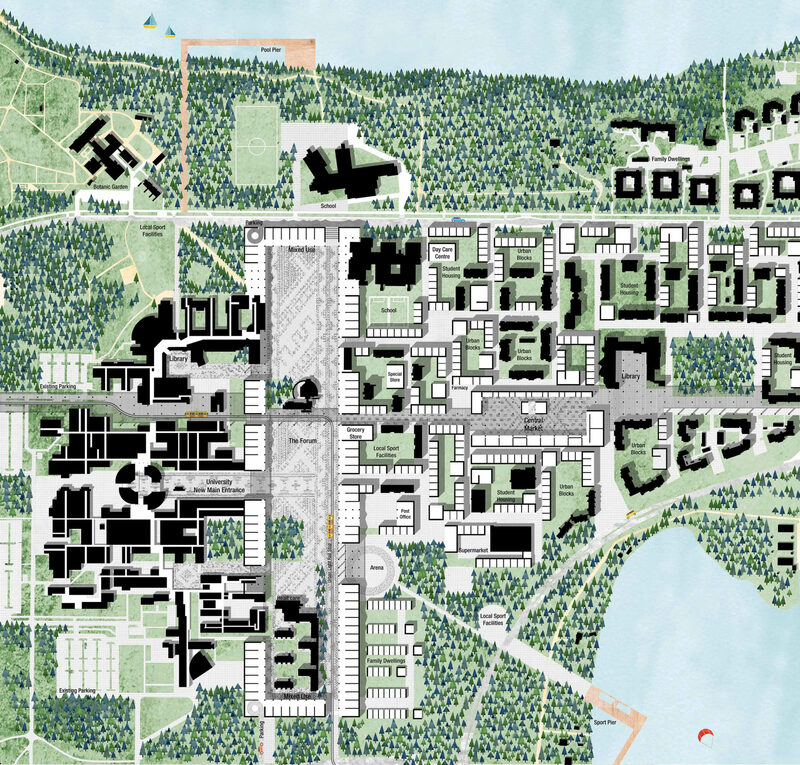 Its role would be to create a connective urban space between the new residential blocks of Kaijonharju and the university campus that at the same time partitions them. The Forum and the centre of Kaijonharju would be linked by a sequence of urban spaces. The basic concept was considered successful and innovative in its simplicity. It offers a functioning solution to the problem of disconnection between Kaijonharju and the campus. The newbuilds on the Kaijonharju side have been cleverly adapted to complement the older buildings and they do justice to the existing architectural values. The gradual upgrade of the existing building stock within this plan would be possible. The new city block structure results in flexible and resilient urban structure with a small unit size and easily executable buildings. The route from the university to the library forms a prominent east–west axis. The need for a pedestrian and bicycle route leading to Pyykösjärvi has also been acknowledged. The small-scale, personable identity is created by means of squares with buildings organised around them. The proposed residential buildings are quite anonymous. The main square, Forum, which is at the crux of the overall composition, is in contrast far too large. There would never be enough people in the area to give it the necessary vibrancy and it would always seem desolate. The proposal has potential, but the major challenge lies in a more successful scaling of the Forum square. Productivity is not limited to financial-oriented outcomes. Productivity determines social and economic interactions through adaptative processes: it is an open system. An open system framework aims at guaranteeing a constant interaction between a diverse and uncommon mix of activities. Physical space is the catalyst for community revival in a productive and proactive sense. The open-ended processes originating from space are the means to activate social, cultural and economic production. The development of an open system framework is activated by focusing on public space and social interaction: a bottom-up process. 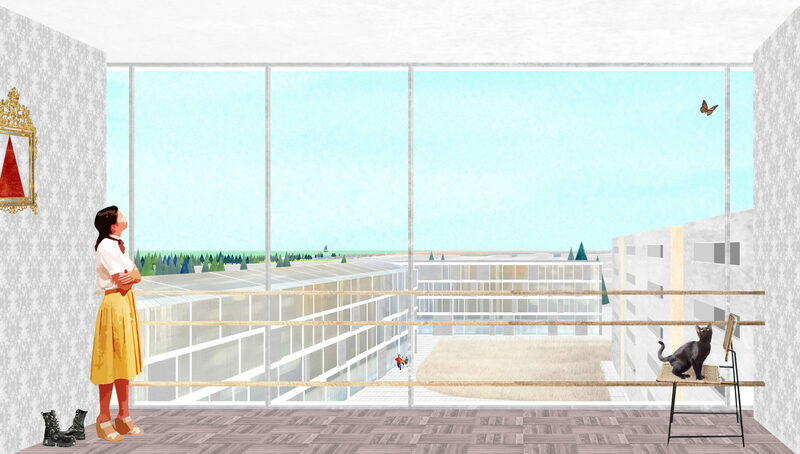 The in-between space and infrastructure of the Forum is the innovative solution that spatially and productively connects Linnanmaa and Kaijonharju: the proactive engine through which diverse relationships and a new urban structure are activated. Every aspect of the urban is seen in a pro(d)active way: the renewed touristic infrastructures towards the surrounding nature and sport facilities; the mixed-use new urban blocks; social interaction; the discovery of a great public space, the forum, with flexible and heterogeneous possibilities of development. Space is constantly negotiated, both in terms of activities (they can change and develop at all time) and city traffic, where cars have to negotiate their space in prevalently pedestrian and cycle-friendly streets. The forum is a space for encounter, between the university productivity and the city everyday activities, community and the surrounding nature, physical space and unforeseeable productive developments. The forum determines a clear and direct connection with the lakes of Pyykösjärvi and Kuivasjärvi that are linked to the whole network by new piers and sport ports. A strong connectivity between Linnanmaa and Kaijonharju is marked by a transversal sheltered space that joins university, forum, urban blocks and the new central market of the city. Parterre is treated as the unifying element of the new structure, which partakes in the construction of a proactive environment. The city integrates part of the existing buildings into a diverse range of new urban blocks, intended not as residential areas only but as open opportunities for housing and local/urban activities to interact with each other. Social and economic incubators for activities and community encounters are located in each block.